ddressing a first-ever meeting of chief ministers of five Himalayan states, Singh also asked Jammu and Kashmir, Himachal Pradesh, Uttarakhand, Sikkim and Arunachal Pradesh governments to undertake developmental activities along the 3,488-km long Sino-Indian border so that people living in these areas do not have to migrate. “Due to perceptional differences, there have been transgression by the Chinese PLA in the past. Such incidents have come down now. Sometimes armies of both the countries come face to face which we call face-off. Such incidents are resolved through the existing mechanism,” he said at the meeting. The meeting comes days after India refused to participate in China’s Silk road project ‘One Belt, One Road’ conference in Beijing and a month after the diplomatic tussle over the Dalai Lama’s visit to Arunachal Pradesh. Chief ministers of Uttarakhand, Sikkim and Arunachal Pradesh Trivendra Singh Rawat, Pawan Kumar Chamling and Pema Khandu respectively and representatives of Jammu and Kashmir and Himachal Pradesh attended the meeting. “As we are aware Indo-China border is undemarcated, we have to be very vigilant while guarding the borders. The ITBP has been guarding the Indo-China border since 2004. They are performing their duty with great courage and alacrity,” he said. The home minister said inhospitable conditions near the border makes patrolling extremely difficult and in spite of these odds the security forces were doing a great job. He hoped that future action plan on border security will be chalked out after analysing key outcome of independent patrolling along the boundary. Singh said the problem of connectivity in border areas pose several challenges which needed to overcome. 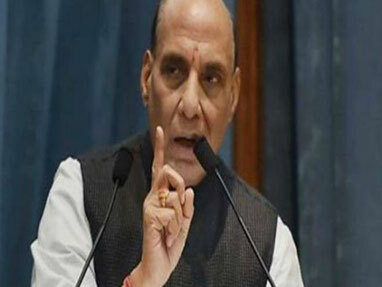 The home minister said thinning of population and migration from the border areas is a cause of concern. “We need to strengthen basic infrastructure in border areas so that people don’t migrate to other places looking for better opportunities,” he said. Singh said the central government is focussing on consolidated development of model villages in border districts. Last year funds were released for 41 such villages. “The states should send more number of proposals to the Centre for development of model villages in the border areas,” he said. The home minister said states should remove obstacles in border infrastructure development and problems pertaining to land acquisition and clearances need to be resolved. The state governments should send senior officers every six months to border areas to review and implement the development works in the villages. “I hope many innovative and imaginative proposals will be discussed here in the meeting to strengthen border infrastructure development,” he said. The home minister said in the first stage MHA is building 27 roads near the border which will be completed by 2019-20. Approval is being given to 48 other roads. The objective of the chief ministers meeting is to strengthen the coordination between the Union home ministry and the five states along the Sino-Indian border to improve the overall border security. The home ministry has said the states were also partners in maintenance of security along the border. India shares a 3,488 km-long border with China that runs along the states of Jammu and Kashmir, Himachal Pradesh, Uttarakhand, Sikkim and Arunachal Pradesh. The total length of the border in Jammu and Kashmir is 1,597 km, Himachal Pradesh 200 km, Uttarakhand 345 km, Sikkim 220 km and Arunachal Pradesh 1,126 km. The border is not fully demarcated and the process of clarifying and confirming the Line of Actual Control is in progress. The Indo-Tibetan Border Police Force (ITBP) guards this border and has established 173 Border Out Posts (BOPs).